John Buchan on BBC Radio 4 Extra. This week on BBC Radio 4 Extra the intrepid Richard Hannay grapples with German spies in The Thirty-Nine Steps and Greenmantle. Go here for the schedule or to listen; episodes can usually be heard for up to a week after broadcast. Foxwell on Millay and mystery. 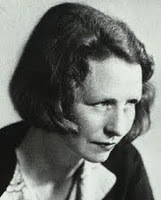 Mystery Scene has recently posted my 2003 article on "'Me and Eddie Poe: Edna St. Vincent Millay's Foray into Mystery," which discusses Millay's "Murder in the Fishing Cat" and possible motivations in attempting to write mystery. New light on the neglected. An unexpected sidelight to the Authors Guild's lawsuit against HathiTrust is the attention it has garnered for authors and works that may have been neglected in recent years (although I was stunned that J. R. Salamanca's The Lost Country  initially was included in HathiTrust's orphan works list. Prof. Salamanca was a major presence at University of Maryland––College Park when I was a student there and has just signed an ebook deal for one of his works). One work initially on HathiTrust's orphaned list (pulled when the heir of the estate, Harvard, was revealed) was Pulitzer Prize winner James Gould Cozzens's first novel, Confusion (1924), which he published at age 21 and is deemed by Daniel S. Burt in The Chronology of American Literature (2004) to be "pretentiously overwritten" (371). Cozzens himself ended up not thinking much of the novel, which focuses on the search by a young Frenchwoman to realize her ambitions. Cozzens is on the Haycraft-Queen Cornerstone list for his fine novel The Just and the Unjust (1942; about the effects of a murder on a small town, especially its implications for the ambitious assistant DA. A 1942 issue of Esquire chose The Just and the Unjust as a good Christmas present for an "average reader," along with Maugham's The Hour before the Dawn). Cozzens also wrote "Foot in It" (Redbook 1935; repr. as "Clerical Error," EQMM June 1950 and Muller & Pronzini, eds., Chapter & Hearse; adapted for Tales of the Unexpected, 1983). Raymond Chandler thought highly of Cozzens's Guard of Honor (1948). Gordon Van Ness has written an interesting essay about Cozzens's work in honor of Cozzens biographer Matthew J. Bruccoli, including Cozzens's criticism of Fitzgerald, Dos Passos, and Capote as well as his own work: "To learn to write and to write decently is simply a much longer and harder thing than is generally admitted" (203). I also found that full text of Leslie Ford's The Girl from the Mimosa Club (1957, selected by Mystery Loves Company bookstore as one of the best mysteries of the 20th century) is in the HathiTrust library. After consulting with author Marcia Talley (who knows a lot about Ford's oeuvre and personal background), checking copyright records, and reviewing copyright law, I think it probably did go out of copyright. Exhibition: SF in crime fiction. The exhibition "Bullets across the Bay: The San Francisco Bay Area in Crime Fiction" at UC Berkeley's Doe Library is on display until February 29, 2012, including authors such as Anthony Boucher, Dashiell Hammett, John D. MacDonald, Marcia Muller, Bill Pronzini, and Julie Smith. Article about the exhibition here. Product of the Day: Edgar Allan Pooh mousepad. 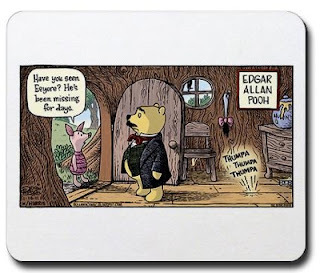 By Bizarro artist Dan Piraro: The Edgar Allan Pooh mousepad (other products with this artwork also available). In "What's in a Name? Mystery Subgenres Explained" over at the new online publication the Washington Independent Review of Books, I attempt to briefly explain the various mystery categories (e.g., cozy, noir, thriller), listing classic and contemporary examples of each. Golden Duck reprints Allingham's Oaken Heart. Golden Duck, which had previously published Julia Jones's biography The Adventures of Margery Allingham, has reprinted Margery Allingham's splendid nonfiction work on life in a World War II English village, The Oaken Heart (1941). Read the Telegraph review of the reissue here. Jones wrote an article for Clues 23.1 (2004) on Allingham's book reviews in Lady Rhondda's feminist journal Time & Tide. John le Carre on BBC Radio 4 Extra. 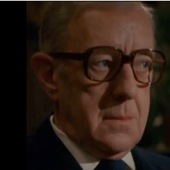 George Smiley fans, rejoice: This week, BBC Radio 4 Extra features The Honourable Schoolboy and Smiley's People. Go here for the schedule; episodes can usually be heard online for up to a week after broadcast. A. E. W. Mason's The Prisoner in the Opal (1928). A. E. W. Mason's The Prisoner in the Opal (1928), "a delightfully silly mystery." 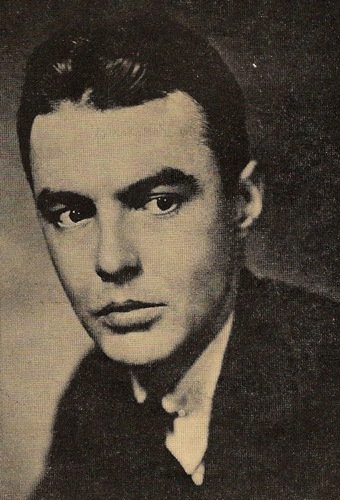 Mason is best known for The Four Feathers (1902) and Fire over England (1936), but he also wrote mysteries such as At the Villa Rose (1910) featuring Inspector Hanaud. Literary treasures of the Bodleian. • The first ten Penguin books issued in 1935, including Oxford graduate Dorothy L. Sayers's The Unpleasantness at the Bellona Club. Sharp-eyed viewers also will spot Agatha Christie's The Mysterious Affair at Styles, but according to Jeremy Lewis's Penguin Special (2005), Penguin eventually pulled this over contractual issues. • Telegram received by the Cedric from the Titanic: "Require assistance . . . Struck iceberg." • Jane Austen's unfinished novel The Watsons (1804–07). More about the novel here. Ian Rankin, John Thaw on BBC Radio 4 Extra. This week on BBC Radio 4 Extra, Rebus uncovers more than simple theft in Ian Rankin's short story collection Beggars Banquet. Mystery fans also may be interested in Sheila Hancock's recollections of her late husband, Morse's John Thaw. Episodes generally can be heard online for up to a week after broadcast. Philosopher, writer, and spirituality seeker Henry FitzGerald Heard, known in mysterydom as H. F. Heard, was born today in London in 1889. He published three books with beekeeper-sleuth Mr. Mycroft: the Haycraft-Queen Cornerstone work A Taste for Honey (1941), Reply Paid (1942), and The Notched Hairpin (1949), and one short story, "Mr. Montalba, Obsequist" (repr. The Misadventures of Sherlock Holmes, ed. Sebastian Wolfe, 1989). He also published Murder by Reflection (1942). Wildside Press has reissued his The Great Fog and Other Weird Tales (1944). The Bunburyist has clocked its 50,000th pageview—probably modest in comparison to some other blogs, but considering I started this blog as an experiment with no clue that it would be of interest to anyone, I'm gratified that people seem to like it. Thanks for the support. Clues 29.2: Simenon, Stout, Sayers, et al. • Analyses of two matchups of the detective vs. archcriminal. The first one is Rex Stout's Nero Wolfe and Arnold Zeck; John Littlejohn looks at Stout's reasons for creating a major adversary for Wolfe. The second is the Sara Martin Allegre's examination of the complex relationship between Ian Rankin's Inspector Rebus and his nemesis, "Big Ger" Cafferty. 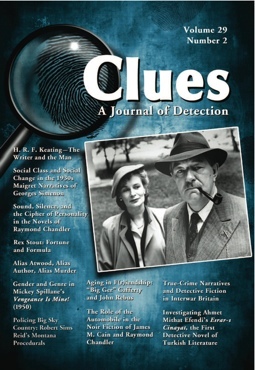 • Detection Club president Simon Brett pays tribute to his late colleague H. R. F. Keating: "Whenever I think of Harry, I think of the Olympic Diving competition." • Dorothy L. Sayers's engagement with true crime between the wars by Victoria Stewart. • The role of class in the 1930s Maigret novels of Georges Simenon by Bill Alder. • The use of sound in the works of Raymond Chandler by Eric Rawson and the role of the automobile in the works of Chandler and James M. Cain by Shelby Smoak. • Gender bending in Mickey Spillane's Vengeance Is Mine! (1950) by Heather Duerre Humann. • The Montana-set police procedurals of Robert Sims Reid by Rachel Schaffer. • Margaret Atwood's techniques that lead the reader to become a detective by Lisa A. Wellinghoff. Margery Allingham on BBC Radio 4 Extra. This week on BBC Radio 4 Extra the amnesiac Albert Campion struggles to uncover his own identity in Traitor's Purse (one of the favorite mysteries of 1941). Go here for the schedule; episodes can usually be heard online for up to a week after broadcast.